Shaped by emigration, war, and generations of the mixing of cultures, Okinawan fine arts developed into its own unique style. That style is on display until tomorrow at The Nippon Gallery at The Nippon Club (145 W. 57th Street). 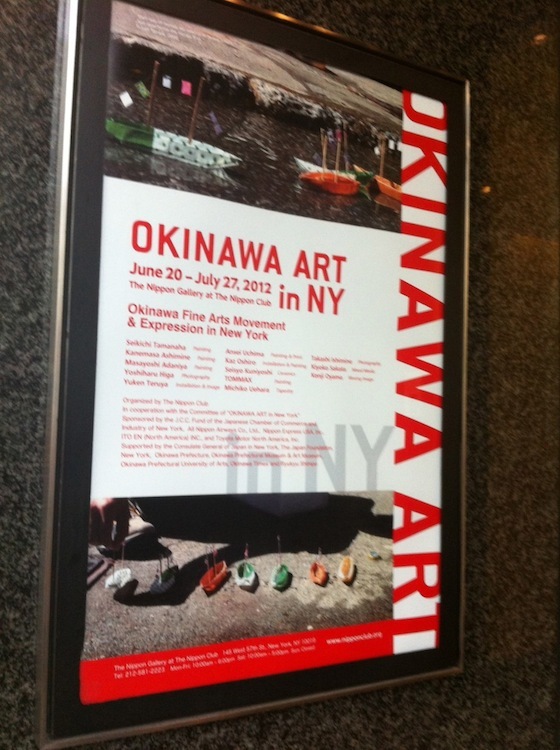 Curated by Naoki Onaga of the Okinawa Prefectural Museum and Art Museum and coordinated by Yasuko Honda of The Nippon Club, Okinawa Art in NY: Okinawa Fine Arts Movement and Expression in New York explores the works of 13 artists. Okinawa, Japan’s southernmost prefecture, is known primarily for its difficult history with the US military occupation following World War II and for the ongoing debates surrounding the bases that continue today. Yet, as The Nippon Club demonstrates, Okinawa is rich in artistic and creative talent. 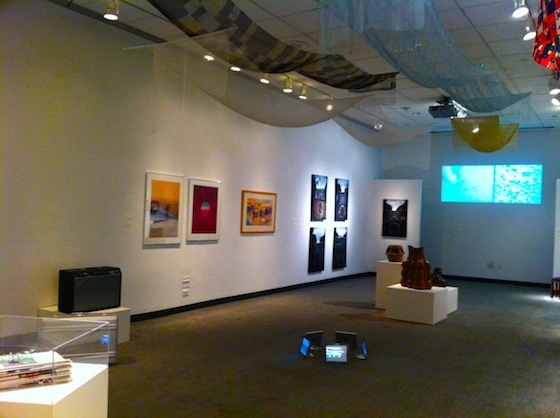 The exhibition is structured using three different “chapters” – Post-war history of Okinawa occupation and migration, Okinawan artists in the United States, and Artists in Okinawa – and features paintings, sculpture, video, photography, and textiles. Each work takes us through Okinawa’s history and reflects the influences from China and Southeast Asia – when the prefecture was independent and known as the Ryukyu Kingdom – from the Japanese mainland, and from the US presence on the tiny island. Masayoshi Adaniya (1921-1967) painted portraits of US military commissioned officers. Seisho Kuniyoshi (1943-1999) originally studied in the Okinawan tradition of Tsuboya ceramics, but gradually developed his own style, as evidenced by his contemporary vases. Michiko Uehara was influenced by the politics of the 1960s as well as Okinawa’s reversion from US rule to Japanese governance. Her textiles, made from extra-fine silk, hang from The Nippon Gallery’s ceiling. Two of the exhibition’s artists are based in New York: Yoshiharu Higa, who received his MFA from Columbia University and is Professor Emeritus at Long Island University; and Yuken Teruya, who earned an MFA at the School of Visual Arts and is the youngest artist in the exhibition. Ansei Uchima, a Nisei (2nd generation Japanese) who was born in California and studied architecture at prestigious Waseda University in Tokyo, moved to New York in 1960, where he lived until his death in 2000 at age 79. Next Next post: Are You Ready for Some Ramen?